The first project of the second semester was fine art which is something I have always been interested in. It is so diverse and when given the same project brief every single person will come out with something different. Collaboration was new for most if not every person who was in the group and it was a good time to try something and learn with others. This being said my collaboration partner was Will Bell, both Will and I had never spoke before but through the process got to know each other well. We both had very different approaches to fine art, while I was a painter with a strong attention to detail Will was quite the opposite a painter/sculptor with a keen interest in abstract work. It was a good choice as we both learned different skills from each other. We began our process with mind mapping what we enjoyed and disliked and in the end up we both liked nature/scenery and so we had our starting point. We also added things we singularly liked but hadn’t tried which was overlapping and embroidery. We researched a vast majority of artists who particularly focused on line work and simplicity. We looked at Antony Gormley, Laura Hoptman, Louise Hopkins, Frank Gehry and took inspiration from their work and processes. Gillian Bates is a contemporary textile artist and her work is done as if she is using a thread and needle instead of pen, with block colours and landmark/scenery work she was someone we were directly influenced by. David Bushell was another artist who used bold colours and overlapping just like Will was interested in and we therefore linked him with our work too. Abstract was something I never understood so when Will introduced it to me and how we could incorporate it in our project I was quite intrigued. We looked at where we were both from and where we are now: Coleraine (NI), Dundee and Allendale. Latitude and longitude became something we focused on as well as distance but we never combined this element in until the end. We used coloured paper and I taught Will how to embroider/thread (he hated it by the end). Our motive behind the piece became about change, coming together, landmarks and transition which is how we discovered our project name ‘6.6646 to 2.2457’. These co ordinates are that of where we are both from (latitude). To intertwine this with the piece we created a latitude line along the bottom and sewed these numbers in each side with Dundee landmarks in the middle. Once we discovered what it was we were actually doing we looked at particular landmarks of interest and combined them together. 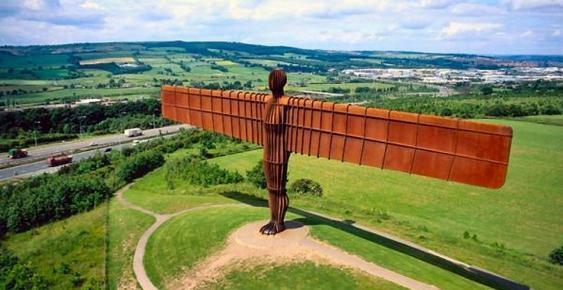 I chose the beacon of hope, Carrick a rede bridge, Mussenden temple and Giants causeway whereas Will chose Angel of the North, Grey’s monument and Tyne bridge. 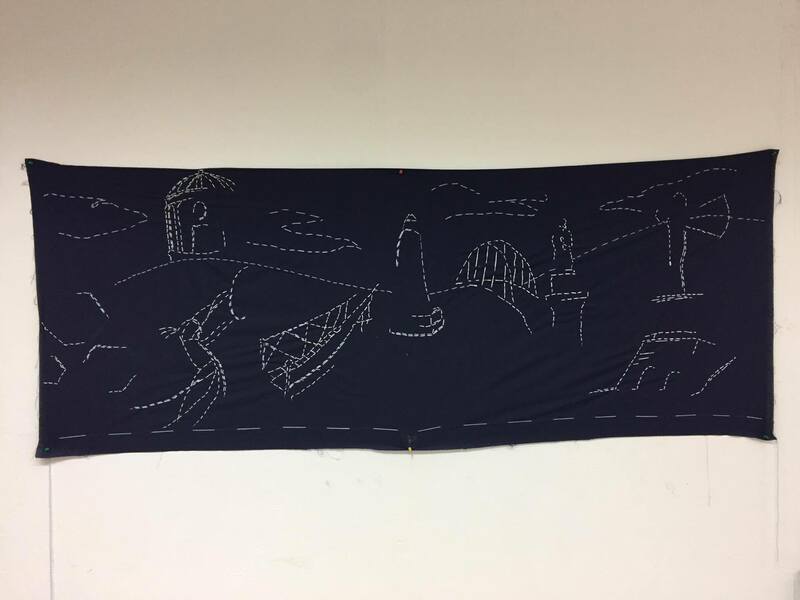 We decided to half stitch each landmark so they were identifiable but abstract at the same time and showed the change into Dundee’s landmark the Law. The next action we took was to go to town/hardware store and source some materials, we bought two metres of navy fabric, 2 light blue yarn and white yarn for highlight. From here we spent the rest of the week progressing and adapting the changes to the fabric to create something we were equally happy with. We also decided to have an abstract shape of a hill throughout the material as where we are both from (although very different) was mostly countryside and fields. The finished piece can be pictured below.